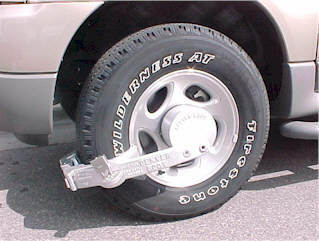 The original wheel immobilization device. The standard denver boot is designed to fit vehicles that have a flat rim face. The difference between the standard boot and the 4x4 boot is the amount of height inside the hub. The standard boot will fit the majority of the vehicles on the road. On the right is the hub that comes with the standard denver boot. The purpose of the hub is to prevent access to the lug nuts for removal of the entire tire. The 4x4 denver boot is designed to fit vehicles with a 4x4 hub. Both the 4x4 denver boot and the standard denver boot use the same clamp and arm. The only difference between the two is the hub cover. On the left is the hub that comes with the 4x4 boot. The important things to know are that it is light weight at 14 pounds (half the weight of most other boots), it does not rust or require paint and it is easy to install. 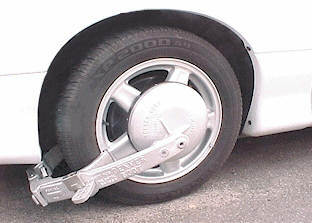 The boot is a three piece assembly: wheelclamp, hub (lug nut) cover, and arm. The arm has two pockets which allow for an adjustment for wheel size (larger or smaller). The three piece assembly allows for a compact device and is very easy to transport in multiples. The Denver Boot is made primarily for street worthy vehicles. It will fit most cars, pickup trucks and vans. 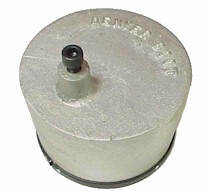 A special hub cover can be used with 4 wheel drive vehicles with extended hubs. When paint is requested, the hub cover and arm are painted for "higher visibility" purpose. As the boot does not rust, the paint is not required for protection. This is a cosmetic and often desired requirement. A rubber gasket around the rim of the hub cover protects the vehicle from scratches. Please call, fax, or email for pricing information.